Preparations were made, reservations were booked, and the countdown began. The day finally came. TPI Extravaganza 2014 arrived! Oh yes, it was a BLAST. This was my very first time attending Extravaganza, and I must say I had a good time. From the first General Session to the Welcome Event, up until the very last minute of the Site Inspections and every event in between, the expectations were high. For those who were in attendance, I am sure you do agree that Extravaganza 2014 was a hit. 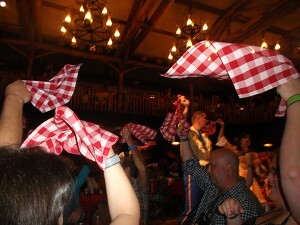 One event that I absolutely loved was a very special one- The Hoop Dee Doo Revue. And guess what I, yours truly, and Luis my colleague, got to coordinate. The Event was sponsored by The Mark Travel Corporation. A total of 30 agents, myself included, were eager to see what was in store for us. The reviews I read online mostly said, ‘This dinner show is to die for’. We were treated with welcomes when we got to Disney’s Fort Wilderness Resort and invited into the show room. We sat along three tables since we were a large group. The room was also filled with other regular guests and families on vacation. I took interest in what was on the table. Care to guess? Food of course. A huge bowl of delicious looking salad, cornbread and butter. I must say that the cornbread and butter was the best I’ve had in a long time. The show started with cast members singing and dancing while interacting with everyone in the room. They yelled out birthday wishes, anniversaries, and anything that made the entire room light up with smiles and laughter. The mood in the room was happy, a very happy feeling not only for the little ones but also the old. Cast members tuned to a song that was basically introducing us to the main course. They marched and shouted as the waiters and waitresses SLAMMED buckets of chicken and pork ribs on our tables. We were amazed at how much noise filled the entire room as a result of the act. So again – food in front of me and yes, it was all delicious. The rest of the show was comprised of a story-like tale that we had to follow, and the cast members involved the audience as well. Some audience members were asked to join the cast members up on stage to perform a few acts. One of our very own agents, Nathan Medina, was one of the chosen few to go up and perform. They had him wear costumes and included him in the storyline, songs and jokes as well. At the finale, the last song included an introduction to dessert – strawberry shortcake. Oh my God – now that topped the entire evening off. The cast introduced themselves and then gave each of the audience members a certificate for their bravery in taking on their roles. As the show lights were turned off one by one, all cast members left the stage. It was over indeed, but we all still wanted more. We got back on the bus and as we drove through the wilderness, we talked about our favorite moments from the show and shared laughter with each other. I later thought of how much fun I’d had and as I lay down that night, I wondered, Is this my favorite part of the Extravaganza 2014? and another thought came to my mind: I am sure there is so much more fun still planned in the days to come. I smiled as I started to fall asleep.